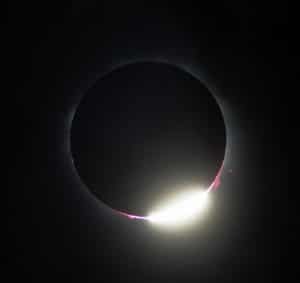 A truly unique total solar eclipse cruise experience. Enjoy 15 days of five-star luxury aboard the privately chartered, 330-passenger M/S Paul Gauguin – sailing June 26 to July 10, 2019. Step ashore on famed Pitcairn Island (seas permitting), where Fletcher Christian and eight other mutineers from HMS Bounty escaped British naval law by founding a “free” settlement in 1790. Stand in the Moon’s shadow for three minutes and 16 seconds during the July 2 total eclipse of the Sun. 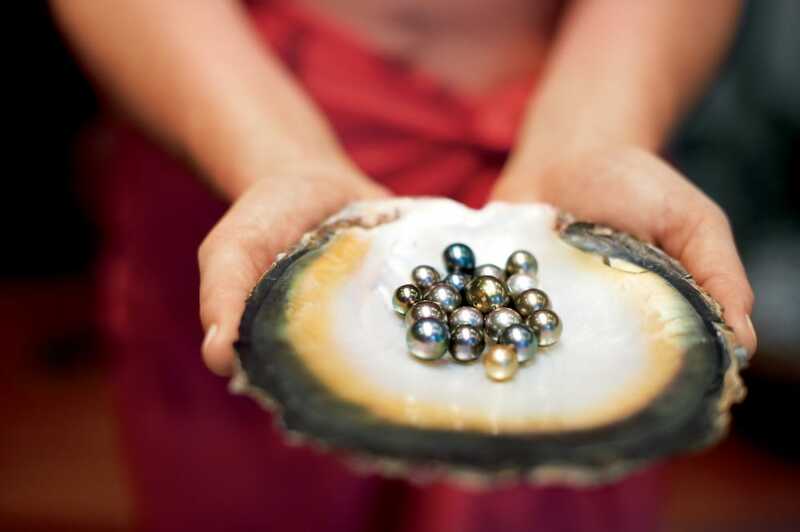 Discover South Pacific gems such as Bora Bora, Moorea, Rangiroa, Huahine and Taha’a. Gain new insights into astronomy and Polynesian culture through a rich program of shipboard lectures presented each day at sea. Finding the best spot to view a total solar eclipse can be challenging on a planet whose surface is more than 70 percent water. Sometimes the secret is to charter a small, nimble ship that can get you exactly where you need to be. And when the ideal route takes you across the South Pacific, island hopping among tropical gems, you have an unmatched opportunity to keep one eye on the heavens while experiencing a spectacular taste of paradise right here on Earth. At the turn of the 20th century, post-Impressionist painter Paul Gauguin traveled to French Polynesia to create some of his most renowned masterpieces. 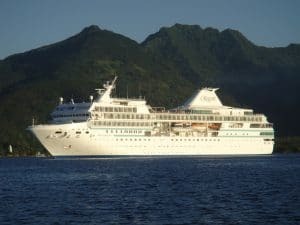 In the summer of 2019, a privately chartered vessel bearing Gauguin’s name will transport our small group of TravelQuest adventurers to the same remote corner of the South Pacific, including famed Pitcairn Island, as we spend 15 days exploring exotic archipelagoes and then on July 2 gather at a perfect viewing point to witness the total eclipse of the Sun. 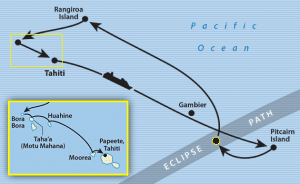 During the total solar eclipse on July 2, 2019, the Moon’s shadow will mainly pass over the Pacific Ocean – including a point just north of Pitcairn, the only inhabited island in a remote volcanic archipelago. It was here that the notorious Fletcher Christian and eight other mutineers from HMS Bounty escaped British naval law by founding a “free” settlement in 1790. 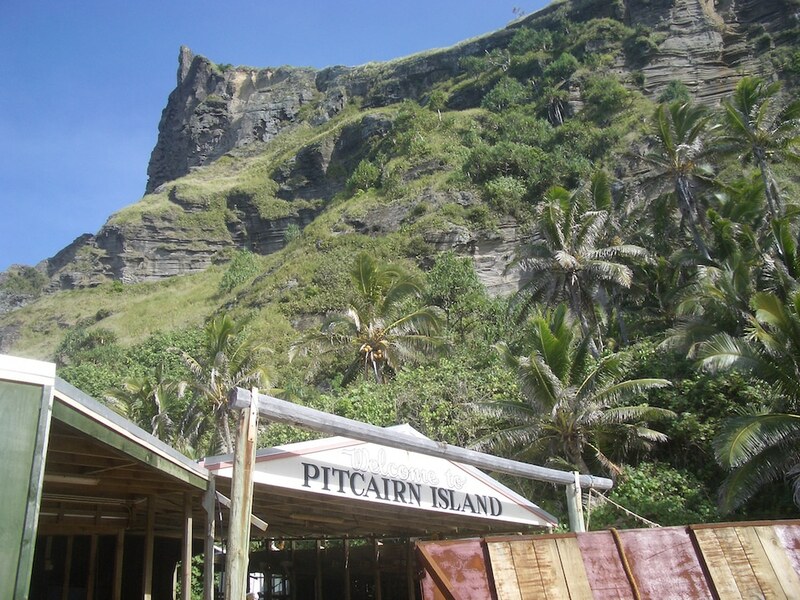 Even today, Pitcairn is visited by only a small number of ships – most arriving with too little time for passengers to disembark. While a Pitcairn landing is not guaranteed on our TravelQuest voyage, we’ve designed our itinerary to allow a window of about 36 hours in which we hope to set foot on this two-mile-long speck in the vast Pacific. 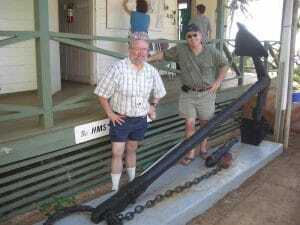 Highlights ashore include a visit to Pitcairn village to see the anchor of HMS Bounty and the ship’s Bible – plus chances to meet local residents, some of whom still bear the surnames of the original mutineers. Shipboard eclipse expeditions have an advantage over those on land because of their nearly unlimited freedom to move to find an opening in the clouds. The July 2019 eclipse track lies beneath the subtropical high-pressure area that dominates the Southern Hemisphere mid-latitudes, and so cloud cover is tropical in character with many openings between convective buildups. Satellite images reflect this climatology, with average cloudiness above 60 percent along most of the oceanic track. Computer models of cloud cover at TravelQuest’s planned observing site show that 6 days of the month are sunny and 6 days overcast, leaving a partly cloudy skyscape to the remainder of the days. Ship mobility, guided by high-frequency satellite images that reveal cloud movement and development, will allow the TravelQuest eclipse expedition to exploit this uneven nature of tropical cloudiness, greatly increasing the odds of a successful expedition. This is your chance to experience the ultimate in relaxation as you explore pristine tropical sanctuaries and discover the rich legacy of Polynesian civilization. 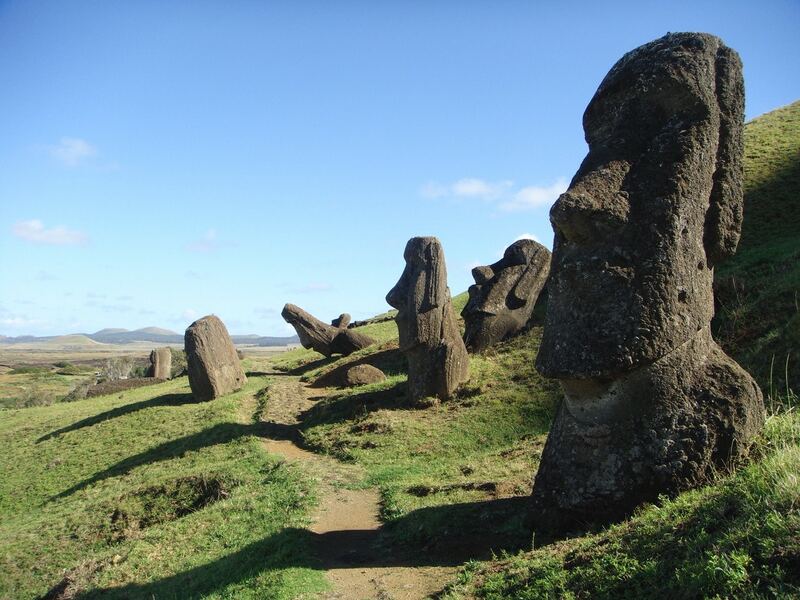 And as an added bonus, in the months ahead TravelQuest plans to offer an optional pre-cruise add-on excursion from Tahiti to legendary Easter Island. Landing at Tahiti’s Faa’a International Airport (code: PPT), you can take a taxi directly to the cruise terminal pier and our waiting ship, the M/S Paul Gauguin. Embarkation begins at 15:00 (3:00 pm), and we sail at 22:00 (10:00 pm). As we sail the South Pacific, the breathtaking ocean vistas are matched only by the sense of peace that comes as you realize how far you are from the usual pressures and cares. And when not simply relaxing, enjoying the views and our ship’s amenities, you can gain new insights into astronomy and Polynesian culture through our daily expert lectures. 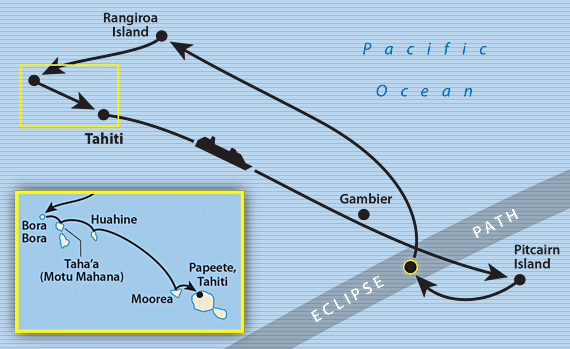 During the total solar eclipse on July 2, 2019, the Moon’s shadow will mainly pass over the Pacific – and its path will include a point just north of Pitcairn, the only inhabited island in a remote volcanic archipelago. It was here that the notorious Fletcher Christian and a few disgruntled shipmates from HMS Bounty founded a “free” settlement in 1790, after mutinying against the autocratic Captain Bligh. 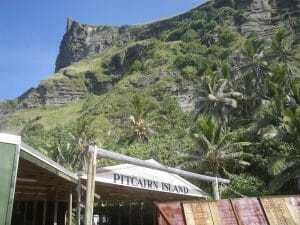 Today Pitcairn is still visited by only a small number of ships, most arriving with too little time for passengers to disembark. While a Pitcairn landing is not guaranteed on our TravelQuest eclipse voyage, we’ve designed our itinerary to allow an extended window in which we hope to set foot on this tiny yet historic island. Highlights ashore include a visit to Pitcairn village to see the Bounty’s anchor and the Bible – and chances to meet the island’s inhabitants, who include descendants of the original mutineers. After a relaxed morning we head off at midday to our expertly chosen viewing site, where you’ll stand in the Moon’s shadow for approximately 2 minutes and 15 seconds. Experience more days of peaceful sailing through spectacular Pacific seascape, enjoying the M/S Paul Gauguin’s three dining venues, extensive spa facilities and five-star service. And each day our onboard experts share more of their deep knowledge of the region and astronomy, including the Southern night skies. 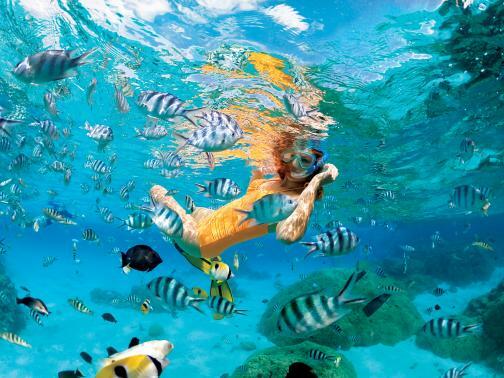 The Tuamotu Archipelago comprises 78 coral atolls scattered over several hundred miles of ocean. Life on these remote islands is simple, peaceful and largely untouched by modern life. In the small villages of Rangiroa, the largest atoll in the cluster, you discover the rich culture of the Paumotu people as they welcome you into their homes and invite you to join in the traditional activities of their daily lives. And the interior lagoons, which are home to many black pearl beds and tropical fish farms, are a natural haven for snorkeling and scuba diving – and our ship can provide you with basic training and all the gear you’ll need. A longstanding dream destination for seasoned adventurers, Bora Bora, with its jungle-clad peaks, white sand beaches and hidden lagoons, seems to have been created for photography. Among the iconic natural features you’ll want to capture is Mount Otemanu, whose jagged, emerald-hued peaks rise steeply from the shore. As for the island’s 4,225 inhabitants, they have a calm, laid-back spirit that will inspire you to simply relax and take in all of that unsurpassed beauty. Choose among three superb shore excursions – or spend your day relaxing on our own private islet, Motu Mahana. Enjoy swimming, snorkeling, kayaking and lounging on the beach with an ice-cold drink from our floating bar. With a delicious seaside barbecue of local specialties, and Les Gauguines on hand to serenade you with Polynesian music and demonstrate traditional Polynesian crafts, it should quickly add up to one of your all-time favorite days. Known as “The Garden Island” for its beautiful rainforests, Huahine offers something new to explore around every bend – from sacred landmarks and archeological sites that are among the best preserved in French Polynesia, to colorful marine life you can experience up close on a scuba or snorkeling expedition. Often likened to James Michener’s mythical Bali Hai, Moorea boasts the kind of spectacular vistas you may have thought only existed in the imagination. The island’s volcanic peaks rise like a shark’s jaw above palm tree-lined beaches along Cook’s and Opunohu bays. And the world beneath the waves is just as magical, as you encounter tuna, dolphins, sharks (from a safe distance) and schools of iridescent fish in waters that are justly celebrated by divers. Our official disembarkation is on the morning of Wednesday, July 10 at 09:30. However, the ship is actually scheduled to arrive at Papeete the evening before: Tuesday, July 9 at 19:30. So it will likely be possible to disembark Tuesday evening after dinner to connect with a late-night outbound flight. 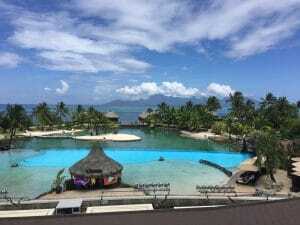 After breakfast, head ashore for onward travels from Tahiti’s Faa’a International Airport. Most stand with their backs to the sea, gazing with hollow unblinking eyes across the windswept landscape. Some have been here for centuries; others were only restored recently after being toppled during the clash of cultures that followed the arrival of the first Europeans. In all, hundreds of these impassive figures – ranging in height from 5 to 33 feet (1.5 to 10 m) – were hewn from volcanic tuff and somehow transported many miles to stone platforms so they could watch over generations to come. Guided by our resident expert, you’ll explore all parts of Easter Island, from the major moai sites to recent archaeological finds that few visitors get a chance to see. At Rano Raraku you’ll walk the slopes of an extinct volcano where nearly 1,000 of the massive figures were quarried and painstakingly carved with simple stone tools. You’ll tour the quarry at Puna Pau, source of the reddish-hued topknot hats, or pukaos, found on many of the moai. 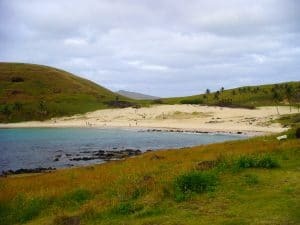 And you’ll visit temple platforms around the island, from stunning Tongariki with its 15 re-erected statues, to Ahu Nau Nau overlooking Anakena beach, to Ahu Akivi in the interior, to the barren north coast, where you’ll discover rarely seen moai on a spectacular day-long hike. When you land at Tahiti’s Faa’a International Airport (code: PPT) according to your own flight arrangements, your TravelQuest representative is there to arrange the easy transfer to our hotel. For the rest of the day and evening you’re free to enjoy the gardens, spa and pools. Enjoy a free day of seaside relaxation, with options such as watersports, pearl shopping, a dolphin cruise or an inland excursion in 4 x 4s. At approximately 1:00 AM, we leave the hotel (late checkout is included) and head to the airport for our non-stop flight to Easter Island, arriving early the following afternoon. Once the immigration formalities are looked after, we carry on to our hotel in time for lunch and a preview from our Rapa Nui guide of the wonders you’ll explore over the coming days. This morning you visit the ceremonial site of Tahai, which boasts three ceremonial ahus with restored statues, as well as the remains of boathouses, a launching ramp and other interesting features. Here you also find the only statue that has had its eyes re-inserted. The nearby museum provides a helpful overview of Rapa Nui’s geology and geography, along with the history of its people. Your tour concludes at the village of Hanga Roa, a short walk from our hotel, where you can visit the historic church. The Caves of Easter Island: On a guided hike along the west coast you reach the Ana Kakenga, or “Two Windows Cave.” With flashlight in hand, and balancing caution with agility, you enter the cave through a small opening and follow an interior path (sometimes slippery with sea spray) until you come to a pair of openings in the rock that offer incredible views of the Pacific. Then, returning to the coastal trail, you walk on to Ana Te Pahu, the Banana Tree Cave, named for the lush vegetation you encounter upon exiting through a tube of hardened lava. Situated near the village of Hanga Roa, the botanical garden features a wide array of tropical and subtropical plants in a beautiful setting. And the nearby museum of “Tadeo and Lili” uses photographs and artworks to trace the life of a fascinating local fisherman, diver and artist. 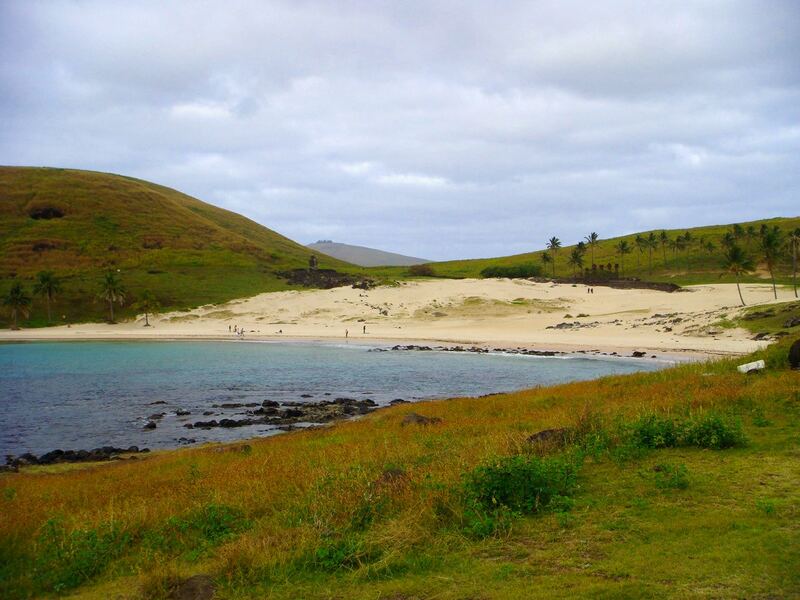 Our first full-day excursion showcases some of Easter Island’s most famous sights. We begin with a drive to the south coast to view several unrestored sacred platforms, or ahus, including Ahu Vaihu, on the bay of Hanga Te’e, and the Ahus of Akahanga. These sites show the impact of the tribal wars that resulted in many moai being toppled over. Next we head to breathtaking Rano Raraku, the principal quarry for nearly 900 stone statues, about 400 of which are now lying or standing on the slopes of this extinct volcano. 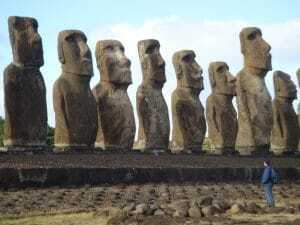 After a barbecue lunch at the quarry’s edge, we drive on to the island’s most recent restoration project: Ahu Tongariki, a dramatic seaside site dominated by 15 impressively restored moai. 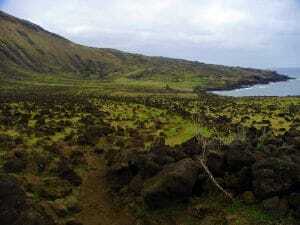 This morning we drive up the extinct volcano Rano Kau, taking in beautiful island vistas and stopping at the edge of a crater lake with panoramic views of the Pacific. At the village of Orongo, a key site of the mysterious Birdman cult that succeeded the moaibuilders’ religion, there are petroglyphs related to the competitions by which leaders would be chosen. From this spectacular vantage point you can see Rapa Nui’s three islets: Motu Iti, Motu Nui and Motu Kao Kao. Then, descending the volcanic slopes, we stop to visit unrestored Ahu Vinapu, which might reflect the influence of pre-Inca architects on Easter Island culture. Our last stop is the seaside cave of Ana Kai Tangata, known for its distinctive wall paintings. Our afternoon drive leads to the port of Hanga Piko, where you board local fishing boats to discover Easter Island from the sea – an unforgettable experience. 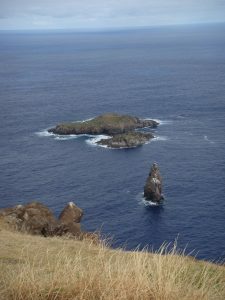 Our boating tour winds among the three islets you saw earlier from above, crossing the waters to Motu Nui where Birdman contenders once swam to on their quest for eggs of the Sooty Tern. Your coastal excursion carries on past the village of Hanga Roa to the ceremonial site of Tahai, where you can see the monumental moai on their platforms as they were first spotted by European explorers three centuries ago. Today you have two choices: spend a relaxing morning in our hotel’s beautiful grounds overlooking the Pacific; or travel to Ahu Akivi for a six-hour hike along rolling coastal trails, with stunning views of the island’s windswept and virtually untouched northern coast. Our route takes you to remote ahus, moai and petroglyphs – most of them seldom seen by visitors. Then in the afternoon we all meet at Anakena, one of the island’s two natural sand beaches, to swim in the Pacific, view the moai of Ahu Nau-Nau and enjoy a barbecue among the palm trees. This morning you can create your own Easter Island experience: enjoy horseback riding, rent a bike or car to revisit your favorite sites, explore the nearby village of Hanga Roa – or get up early for an optional sunrise experience at Ahu Tongariki. 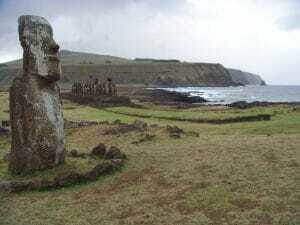 In the afternoon we journey to the center of the island to visit Ahu Akivi, with its seven restored moai – which, according to island lore, represent the seven explorers sent to Rapa Nui by its original Polynesian settler, Hotu Matua. Next we visit unrestored Ahu Hanga Poukura and the quarry of Puna Pau, whose red scoria stone was used to carve the topknots of the moai. After watching the Sun set beyond the majestic moai of Tahai, indulge in a classic Polynesian feast featuring fish, chicken, beef and local vegetables, all cooked in an earthen oven or umu. Then sit back and enjoy a folkloric performance with singing, music and dance – a perfect ending to your Easter Island adventure. 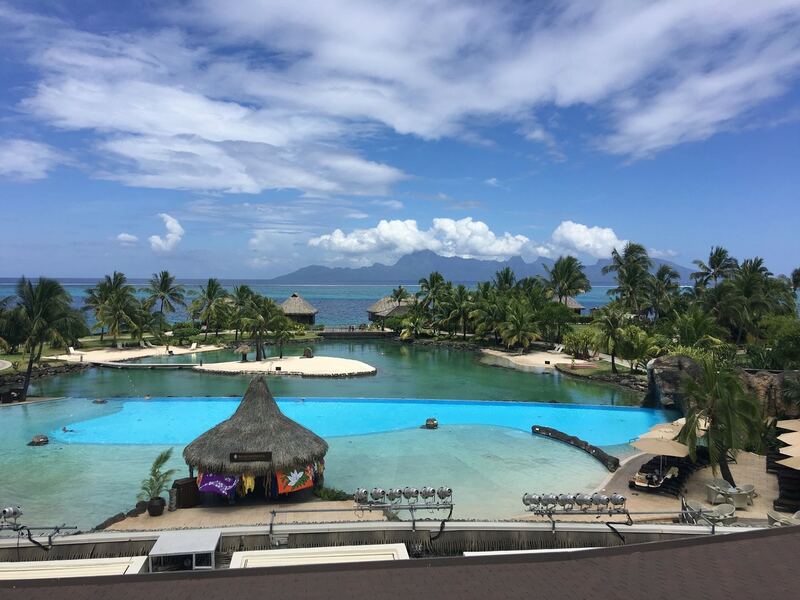 Today you can relax or explore further on your own – returning to our hotel in the late afternoon for a farewell dinner before we transfer to the airport for the flight back to Tahiti. $5580 USD per person, based on two people sharing one room. $7580 USD for single occupancy. A payment equal to 40% of this add-on cost total is due August 26, 2018. Balance payment is due at the time of the final payment for your eclipse cruise – February 26, 2019. All pre-cruise tour advance payments become non-refundable August 26, 2018. 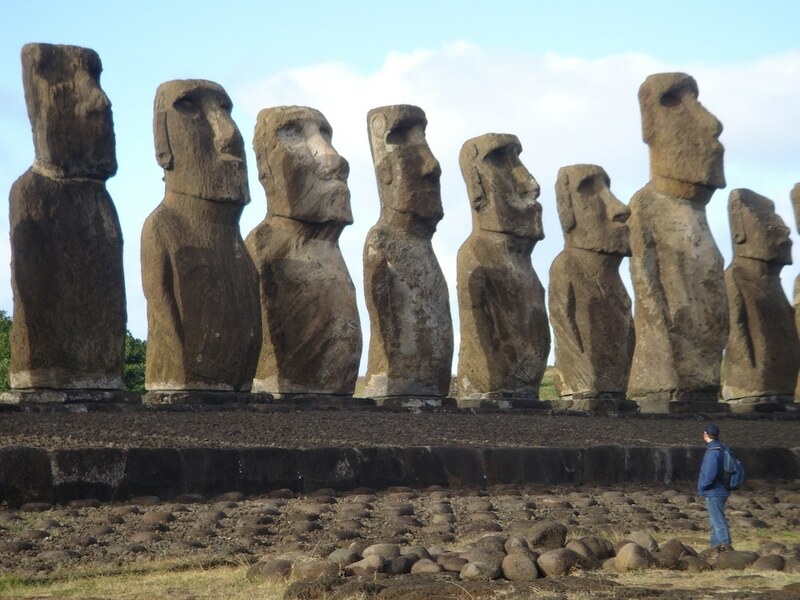 Flights Tahiti-Easter Island-Tahiti is not included in this add-on tour cost. The additional charge for these flights will be added to your invoice in Summer of 2018. As noted in itinerary: all deluxe accommodations, airport/ship transfers, transportation throughout Easter Island, meals as specified with coffee and water, activities and admissions, and an English-speaking guide on Easter Island. At TravelQuest we want to be sure you find the trip that best suits your interests and level of fitness. TravelQuest, working with our partners, makes every effort to follow the published itinerary. However, please keep in mind that it is subject to change depending on weather and other local conditions. Viewing a solar eclipse is particularly weather-dependent, and as such, we can offer no guarantee that local conditions will cooperate. 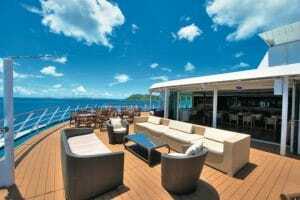 M/S Paul Gauguin – Welcome Aboard! 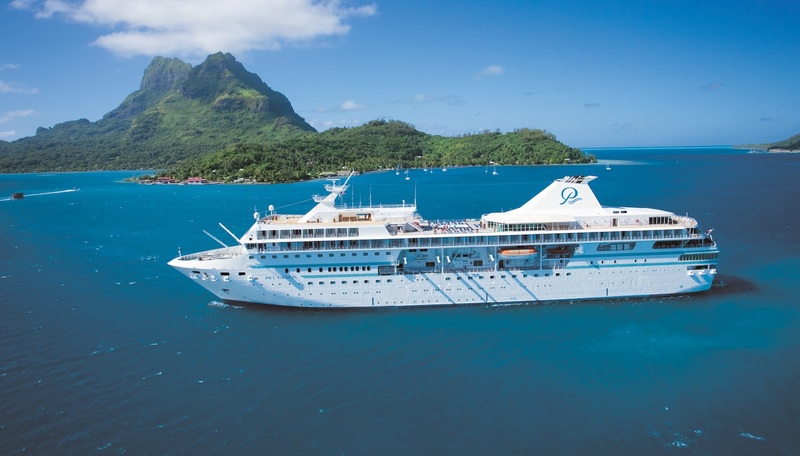 M/S Paul Gauguin was designed specifically to sail the shallow bays of Polynesia, visiting small ports that larger ships can’t reach and blending naturally into the stunning beauty of the islands. Life onboard celebrates the warm, informal spirit of Polynesian culture while delivering five-star service, comfort and luxury. Spacious suites and staterooms, an onboard watersports marina, a choice of three open-seating dining venues and a relaxing spa are among the vessel’s many amenities. And then there are Les Gauguines, a troupe of Tahitians who serve as cruise staff, entertainers and storytellers, adding a unique dimension to every cruise. Paul Gauguin Cruises was voted “#1 Midsize-Ship Ocean Cruise Line” by readers in Travel + Leisure’s 2016 World’s Best Awards. Condé Nast Traveler has recognized Paul Gauguin Cruises on its “Top Small Ships” list for 15 years in a row. The M/S Paul Gauguin has the longest continuous sailing record of any luxury cruise ship in the South Pacific. All ocean-view staterooms and suites – more than two-thirds with private balconies – feature independent temperature controls, queen-size beds (a small number offer twin beds), bathrooms with full-size tubs and showers, televisions, CD/DVD players, refrigerators stocked with soft drinks, safes to secure valuables – plus hair dryers, robes and more. 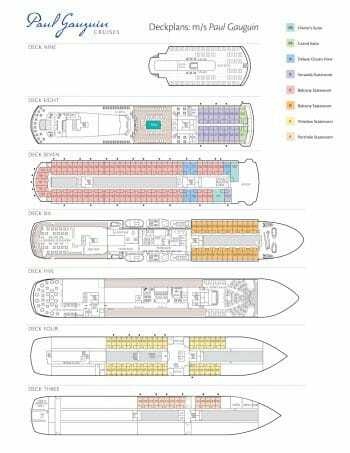 The ship has one wheelchair-accessible stateroom, and a few staterooms can accommodate up to three guests. Superior-quality service is a hallmark of the M/S Paul Gauguin, and you see it as soon as you step aboard. With one crewmember for every 1.5 guests, you’re assured the highest level of personal attention. The staff’s dedication to your comfort and well-being is expressed in a hundred thoughtful acts: the maitre d’ who remembers your name and which table you prefer; the stewardess who places a perfectly ripened mango in your fruit basket; and the extra personal attention from the dive master if you participate in the onboard scuba program. And all of this with no expectation of gratuities – they’re included in your cruise fare. Beverages, including fine wines and premium spirits, soft drinks, bottled water, coffee and tea served throughout the ship. Onboard dive and lecture programs. Two elegant restaurants and one pool-side grill, all with open-seating dining. Vegetarian and wellness-focused meal selections, with special dietary menus upon request. 24-hour room service and in-room dining. Internet Wi-Fi access throughout your entire cruise. In-room movie channels and movies available. Complimentary 24-hour room service is available. During normal dining hours, you may also order from L’Etoile restaurant and enjoy dinner in your suite. For guests who appreciate an enhanced level of personalized service – and are traveling in category B accommodations or higher – butler service is a welcome and indispensable perquisite. Our butlers can assist with your arrival onboard by unpacking luggage, arranging for your clothes to be pressed and making reservations at the spa or one of the ship’s restaurants. 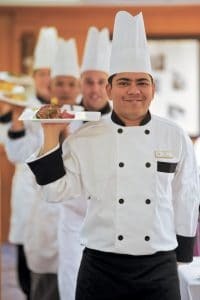 As for your expeditions ashore, a butler can arrange for a private car or make lunch reservations at the restaurant of your choice. Celebrating a special occasion? Have your butler arrange a private cocktail party. These highly skilled specialists can do it all – quickly, competently and without fuss. Onboard laundry and valet services, including pressing, are available with charge and can be arranged through your stewardess for same-day service. Guests who take advantage of our butler service receive complimentary pressing of any items to be worn the first evening onboard. Complimentary Internet Wi-Fi access is included in the cost of your eclipse cruise aboard the M/S Paul Gauguin. You can also make telephone calls directly from your suite or stateroom. There are nine computers and a printer onboard, and fax messages can be sent and received via the reception desk. The ship’s Medical Center is designed to provide care for temporary illnesses and accidents. A licensed and registered doctor and nurse are on 24-hour call for professional and emergency services, which are available at customary charges. Watersports are a highlight of the Polynesian experience, and the M/S Paul Gauguin is designed to take full advantage, offering unique access to intriguing ports and unrivaled adventures. The ship’s small footprint means it can navigate lagoons that larger ships would never dare to enter. And the retractable onboard watersports marina brings you down to sea level, where you can hop aboard a windsurfer, launch a kayak, try water-skiing, or take a Zodiac on one of our optional scuba-diving adventures. Diving into the crystal-clear waters, you’ll come face to face with a colorful parade of marine life, from magnificent parrotfish and clownfish to stately sea turtles. And even if you’ve never tried diving before, you can take advantage of onboard lessons. The M/S Paul Gauguin is the only luxury ship in French Polynesia that offers PADI certification onboard for novice scuba divers. 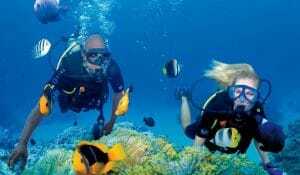 The ship has classes for all levels, from snorkeling to advanced scuba-diving techniques, supervised by a staff of PADI dive masters. For the convenience of guests, all necessary equipment, including an air compressor to refill scuba tanks, is onboard. Prices are per person based on the double occupancy, in US Dollars. Early booking prices are available through August 31, 2017. IMPORTANT: All tour prices, taxes and airfares quoted in this brochure are based on tariffs and costs that were in effect at the time of publication. Consequently, prices herein are subject to change. Due to fluctuations in global oil prices, a fuel surcharge may be added to your tour fee. You will be advised of details and costs prior to departure. A very limited number of guaranteed single accommodations are available in Category E and F at 150% of the double occupancy rate. Single occupancy in all other categories are 200% of the double occupancy rate. 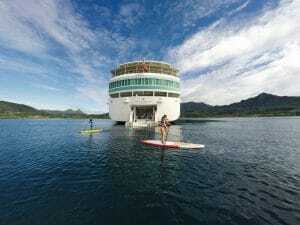 A third person may be added to a double occupancy cabin in most categories, with the third person paying 50% of the double occupancy cruise fare. 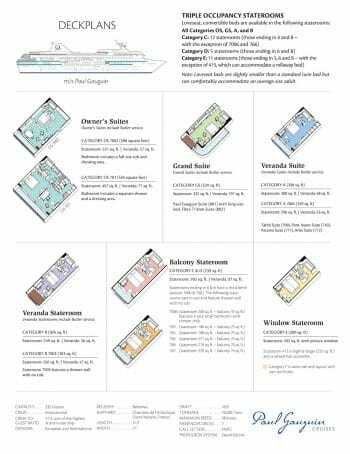 Accommodations in all-oceanview staterooms and suites for 15 days aboard the M/S Paul Gauguin. 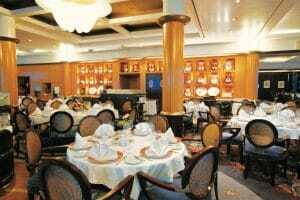 All meals aboard ship with choice of two elegant restaurants and one pool-side grill, all with open-seating dining. Vegetarian and wellness-focused meal selections, with special dietary menus upon request. All shipboard entertainment including new insights into astronomy and Polynesian culture through our onboard enrichment lecture series. A state-of-the-art, retractable watersports platform featuring complimentary waterskiing, windsurfing and kayaking, or take a Zodiac on one of our optional scuba-diving adventures. Refrigerator replenished daily with soft drinks, beer and bottled water. Bar setup and butler service in Categories B and above. Air travel to and from Tahiti (see below); passports & visas; airport luggage handling; possible air and cruise fuel surcharges; deluxe shipboard beverages; shore excursions; $300 per person Port, Handling and Security Fees (subject to change); items of a personal nature, including spa, boutique and laundry services, etc. ; and recommended trip cancellation/medical insurance. Using Paul Gauguin Cruises’ special air program, (schedules and fares will be provided in Fall 2018) will assure you’ll not miss the boat! Where available, this program offers guests the opportunity to upgrade to First or Business class. Carriers and routing are at the discretion of Paul Gauguin Cruises. Requests for specific routing and/or carrier may result in an additional charge. Air rates are subject to change until ticketed. An advance payment of $2,000 USD per person and a completed Reservation Form are required to secure your reservation. A second payment, equal to 40% of your invoice total is due August 26, 2018. Your balance payment in full is due February 26, 2019. Cancellations made from the time of booking through March 25, 2018, will incur a $1,000 USD per person cancellation fee. Cancellations made between March 26 – August 25, 2018, will incur a $2,000 USD per person cancellation fee. Cancellations received after August 25, 2018, are fully non-refundable. If TravelQuest is able to fill your cancelled cabin prior to February 26, 2019, you will be refunded your payments to date, less $1,000 per person. Travel insurance protects you from the unexpected “what-ifs” on your travels. What if your bags go missing, what if you have to cancel, what if you need medical assistance? We at TravelQuest International recommend that you purchase a travel protection plan to help protect you and your travel investment against the unexpected. You may purchase this insurance on your own or you may contact our friends at Travelex who are familiar with our trips and offer a selection of coverages to suit your needs. To be eligible for the waiver of pre-existing medical condition exclusion, their plans must be purchased within 21 days from the time you make your initial deposit to TravelQuest. Otherwise, the plan may be purchased any time prior to departure.